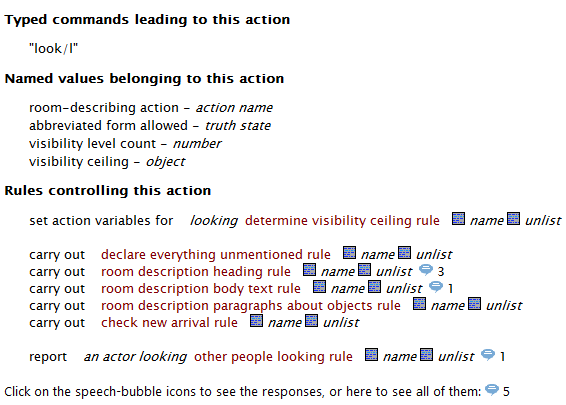 This is the ninth and final entry in a series of quick-start Inform 7 tutorials using examples from Colossal Cave Adventure. More information about this tutorial series can be found here: A Quick-Start Guide to Inform 7. This lesson will cover the darkness of the cave and Adventure’s iconic lamp. It is now pitch dark. Which actions are blocked in darkness? By default, only examine, look under, and search are blocked. 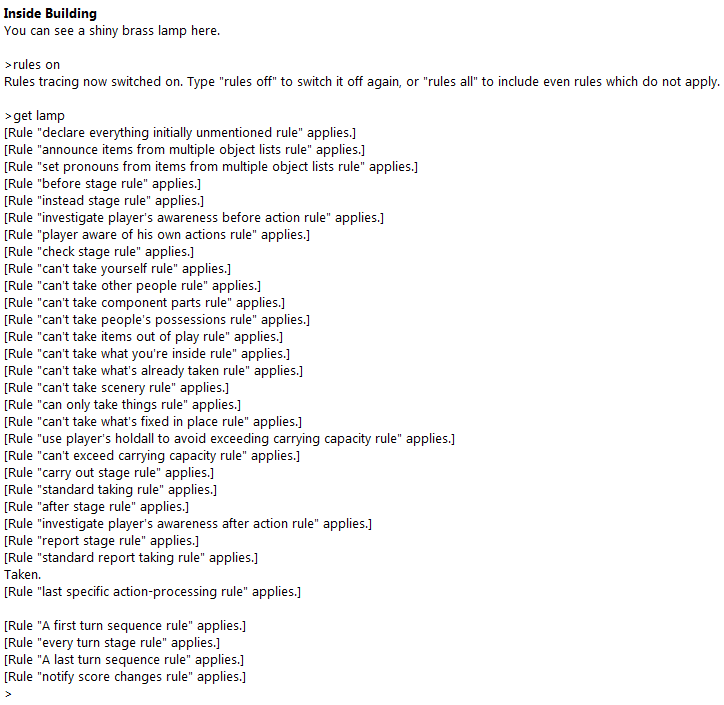 You can check the list for your own game by going to the Index tab, then choosing Actions, and then scrolling down to the Alphabetic listing, where the words “requiring light” will appear beside any actions requiring light. 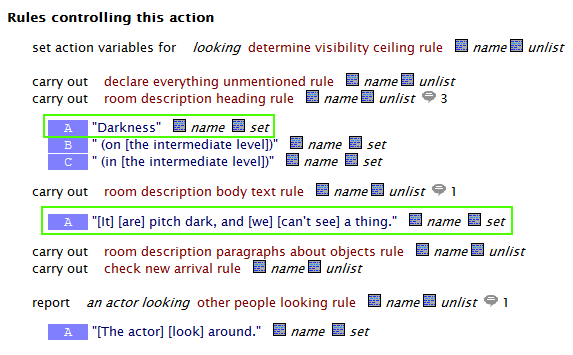 Using the “kinds” system (discussed in lesson 7), we can set up caves as a kind of room that is dark by default. A cave is a kind of room. A cave is usually dark. There is a cave called Low N/S Passage. Now every cave in the game will be dark by default. The regular darkness message in Adventure is different than the regular darkness message in Inform 7.
say “It is now pitch black. If you proceed you will likely fall into a pit.” instead. The Inform 7 handbook explicitly talks about the dark/light system, which makes it easy to find the rules we need to change. But it is sometimes more difficult to figure out what rules are producing a given result, especially when debugging. This is a bit overwhelming, but it does show that the “standard report taking rule” is responsible for printing the word “Taken”, and when. A related technique is ACTIONS ON, which shows every action being executed. Check the Index for the specific action in question. 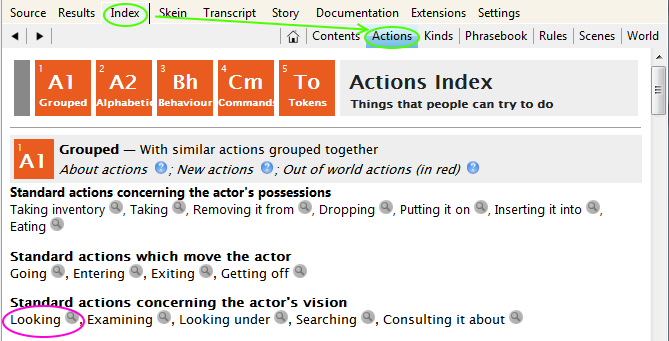 The magnifying glass icon beside each action will take you to a detailed view of the action. 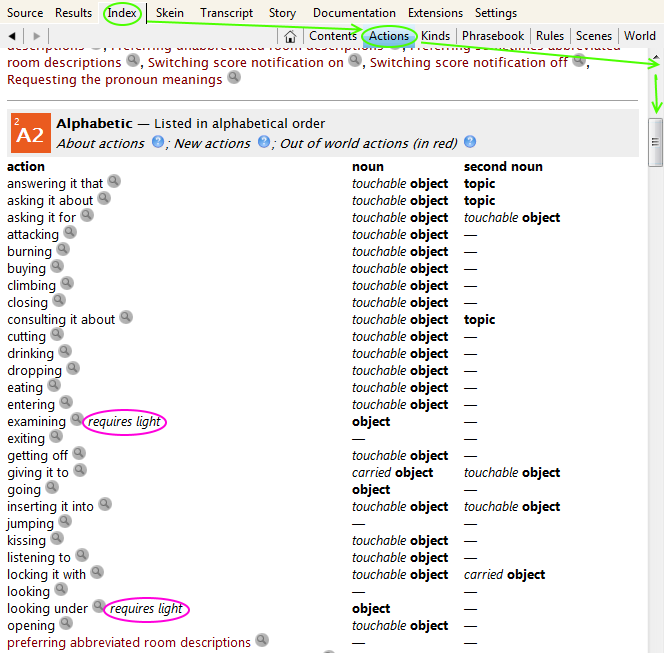 Critical actions like “look” have some notes at the top, but when you scroll past them, you’ll find details about exactly how the action works – what rules control it, what named values it includes, and what the default messages associated are. The speech bubbles here indicate the presence of default responses that are built into the game. If we were still trying to alter the darkness messaging, we could check here for those default darkness messages by clicking the speech bubbles. And here are the two darkness messages again! Note the button marked “set” beside each message. This button will add code to your game that allows you to change the default message. We could have changed the darkness text this way instead of changing the activity, and this would also have been a valid solution. Inform 7 has a built-in kind called the device, which can be switched on or switched off. This is extremely convenient for making, say, shiny brass lamps. A shiny brass lamp is a device in Inside Building. The lamp is battery-powered (despite all my childhood impressions of something Aladdin-esque) and can only endure for so many turns. Every turn, it loses a little more power, and that phrase “every turn” is absolutely a hint as to how this can be implemented. The shiny brass lamp has a number called the power. The power of the shiny brass lamp is 500.
now the lamp is unlit. …so walking through them would be redundant. Part of this lesson addressed the concept of rules, which are the most basic machinery of Inform 7. For the most part, it is not necessary to understand rulebooks work in order to build an Inform 7 game. To peek further under the hood, see Chapter 19: Rulebooks. I’ve learned so much from this series. Thank you! Yes, it should be. Fixing this!